Mulqueeny Eye Centers is not just a premier destination for LASIK vision correction and other types of refractive surgery. We also offer a full range of primary eye care services. These include annual eye health examinations, contact lenses (including specialty contact lens fittings), and treatment of ocular disease such as cataracts, glaucoma, macular degeneration, and dry eyes. Whether you suffer from cataracts or dry eye syndrome or you simply desire to maintain your ocular health, our St. Louis, Missouri-area eye care clinics provide the most advanced care available. We continually invest in the most state-of-the-art diagnostic equipment to provide unsurpassed care for our patients. The Optomap® Retinal Exam gives our eye doctor, Dr. Sean Mulqueeny, a clear view of your retinas without dilation, letting us diagnose problems much earlier than less advanced exams. We also offer nutritional supplements that can help manage or prevent macular degeneration. In addition, the QuantifEYE program is a method of quickly, inexpensively, and conveniently identifying patients at risk for age-related macular degeneration (AMD). A disruption of the function of any one or more of these layers can cause dry eye symptoms. It’s estimated that 20 percent of Americans, women more often than men, suffer from dry eyes, which can cause a range of uncomfortable symptoms. Dry eyes are characterized by a scratchy, gritty, or burning feeling, redness, stringy mucus, and increased sensitivity to light. Wind, dry air, and other environmental factors are but a few of the causes. Surprisingly, dry eye syndrome can also cause excessive watering eyes due to the tears lacking the proper balance of mucous, water, and oil to coat the eyes properly. Chronic dry eyes can lead to damage of the eye’s surface, an increased risk of eye infections, and eventually, the inability to produce tears. Left untreated, severe forms of dry eyes can even damage your vision. At our St. Louis, Missouri centers, we can help patients determine potential causes of their dry eye syndrome and identify appropriate dry eyes treatments. LASIK or another type of refractive surgery can worsen or bring on dry eyes. Similarly, those with extreme dry eyes may be disqualified from undergoing LASIK surgery. Common treatment of dry eye syndrome includes the use of artificial tears or ointments. However, excessive or prolonged use of artificial tears can disrupt the natural production of tears, leading to further aggravation of the condition instead of providing desired relief. EyePromise® EZ Tears™: In addition to topical treatment of dry eye syndrome, many eye professionals are finding the treatment of dry eye disease from the “inside” is a unique and effective means of treating dry eye syndrome. EyePromise® EZ Tears™ is an all-natural, highly purified Omega-3 developed by nutritional scientists to create a propriety blend of nutrients made from the finest, natural ingredients. 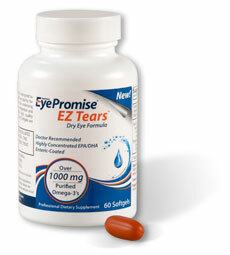 What sets EyePromise® EZ Tears™ apart from other dry eye supplements currently on the market? This nutraceutical is made from highly refined and purified fresh, cold-water Alaskan fish PLUS seven (7) other anti-inflammatory ingredients including antioxidant vitamins A, D and E, evening primrose oil, turmeric extract, green tea extract and mixed tocotrienol/tocopherol. 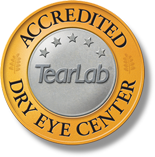 By reducing inflammation, EZ Tears™ improves the quality of tears produced and helps your eyes maintain a healthier tear film. It is also enteric-coated-- making is easy to digest and reducing stomach upset, aftertaste and “fish burp” sometimes associated with other Omega-3’s. The convenient daily dosage of only 2 softgels per day compared to three or four softgels of other leading brands also makes it more palatable for patients. With continued use, EyePromise® EZ Tears™ may give you uninterrupted relief from dry eye symptoms, such as irritated or scratchy eyes, redness, foreign body sensation and excessive watering…often times within 2-3 weeks of starting this treatment. For more information about treatment of dry eye, contact our offices in St. Louis , Missouri to schedule your dry eye evaluation. Restasis®: Often, the root cause of dry eye syndrome is inflammation of the eyes’ tear-producing gland; this inflammation can be triggered or made worse by allergies, smoking, prolonged computer use, and other factors mentioned above. Unlike artificial tears, which only temporarily relieve dry eyes, Restasis® Ophthalmic Emulsion actually stimulates your eyes to produce more tears, addressing the root cause of discomfort. Restasis® is a prescription eye drop that, when used twice daily, causes a noticeable increase in natural tear production that will continue to improve with time. Restasis® can be used in conjunction with artificial tears, though non-prescription eye drops will become less necessary as healthy tear production is restored. Restasis® has been well-tolerated by patients and is currently the only dry eyes treatment to actually increase tear production. To learn more about dry eyes treatments at our St. Louis, Missouri centers, contact Dr. Sean Mulqueeny at Mulqueeny Eye Centers today. As you grow older, you might find that your vision has become clouded and blurred. Colors may not appear as bright as they once did and light may seem overly bright or glaring, particularly at night. You may feel like you see the world through a cloudy piece of glass. If you experience symptoms of this type, you may have cataracts, which begin gradually to affect your vision. If cataracts remain untreated , they can restrict your daily activities and, may cause total loss of vision. To maintain your ocular health, schedule a cataracts screening at our St. Louis, Missouri centers. Nuclear sclerotic cataracts are the most common type. These form in the center of the lens and are caused by aging. They begin with a yellowing and gradually turn brown. Cortical cataracts are also common and are caused by aging. This type forms in the lens cortex and has "spokes" that radiate to the center of the lens from its edges. Subcapsular cataracts begin at the back of the lens. Since these form in your line of sight, they tend to rapidly decrease vision. This type is most common among diabetics and people who take high doses of steroids, have high degrees of farsightedness, or suffer from the inherited condition, retinitis pigmentosa. Surgical removal of cataracts is one of the most refined and most successful surgical procedures in existence. Most commonly, cataracts are removed in a procedure called phacoemulsification, or phaco for short. In this procedure, the cataract surgeon makes a small, self-sealing incision at the edge of the cornea and uses an ultrasonic probe to break up the cloudy lens. The fragments are suctioned away, commonly followed with the implantation of an intraocular lens (IOL). Because cataract surgery is a small-incision, no-stitch procedure, recovery is easy and discomfort is minimal. We think you will be thrilled to find that cataract surgery has advanced tremendously in the past few decades. In the past, the cataract surgeon decided which lens implant to use, and all lens implants at that time were monofocal lenses. Monofocal lenses are able to provide good vision after cataract surgery, but only at a single set distance — usually for seeing distant objects like road signs, movie screens, and ballgames. Those with monofocal lenses enjoy clear vision for these types of activities, but they had to wear glasses for near vision activities such as reading, knitting, or playing cards. Luckily, all that has changed. 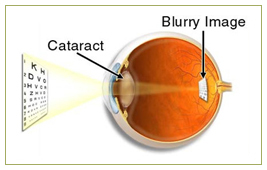 Today, cataract surgery patients can choose the type of lens implant that is best for them. Monofocal lens implants are still useful, and multifocal lenses such as ReZoom™ and ReSTOR® are gaining in popularity because they give patients excellent vision at a range of distances. Intraocular lenses, whether monofocal or multifocal, are easily implanted during cataract surgery and these implants can help you continue living an active life. They can also help treat presbyopia, the loss of up-close vision that comes with aging. Thanks to intraocular lens technology, having to wear thick glasses following cataract surgery is a thing of the past. For safe and effective removal of cataracts in the St. Louis, Missouri area, look no further than the experienced surgeons at Mulqueeny Eye Centers. Contact the practice of Dr. Sean Mulqueeny today. Did you know that a range of diseases, including hypertension, age-related macular degeneration, glaucoma, diabetic retinopathy, and cancer, present themselves first in the retinas? In fact, the back of the eye is the only place in the body that doctors can view the vasculature (blood vessels) of the eye, making it a key place to look for the early signs of both systemic diseases (diseases that affect the entire body, not just the eye) and ocular problems such as retinal detachment, glaucomatous changes, and diabetic retinopathy. The Optomap® Retinal Exam, as part of an annual eye exam, is a crucial step in identifying problems — that can threaten your vision and even your life if not caught early. This comprehensive, state-of-the-art exam provides an ultra-wide view of the retina, which is situated at the very back of your eyes, without dilation. The retina includes a complex network of blood vessels that can be compromised by hypertension, diabetes, and other potentially serious conditions. When examined closely, the retina also alerts your doctor to glaucoma, macular degeneration, and retinal detachment, which can cause blindness if not treated promptly. Not only is the Optomap® Retinal Exam a useful way to diagnose a range of dangerous disorders, it’s easy and comfortable for the patient and takes only minutes to perform. It also has the advantage of generating a permanent record — in the form of a digital photograph — that we keep for comparison, year after year. Such comparison allows us to provide comprehensive, long-term care and to detect changes in your eyes’ health as soon as they develop. Lastly, the Optomap® Retinal Exam requires no pupil dilation, so our patients do not have the inconvenience of light sensitivity and blurred vision that result from dilated exams. 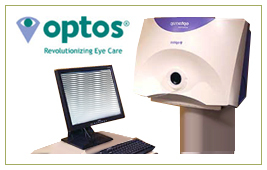 Mulqueeny Eye Centers is proud to offer the Optomap® Retinal Exam to our patients, as it makes diagnosing and treating eye disorders easier for both doctor and patient. Learn more about this and other diagnostic tools at our St. Louis, Missouri centers by contacting Dr. Sean Mulqueeny today. The QuantifEYE® is a quick, non-invasive response test. Based on your eyes response to different levels of blue light presented, we are able to determine the level of macular pigment present in your eye. Studies indicate that low levels of macular pigment indicate higher risk of macular degeneration. A baseline measurement is taken, giving Dr. Mulqueeny your MPOD (macular pigment optical density) score. If you happen to test low to medium (low MPOD is correlated with a higher risk for AMD), he may recommend supplementation to restore depleted levels of zeaxanthin and lutein in your macula. The doctor will then be able to determine, through follow-up screenings, if nutritional intervention is resulting in increased macular pigment. If you’ve ever wondered whether a supplement or vitamin you take is actually working, this test will tell you. We can actually measure results. Macular degeneration has no cure, but it can be prevented. By the time you notice symptoms, some damage may have already occurred and is irreversible and that’s why prevention is key. Ask for this important test at your next eye examination. It’s not too late to take steps to preserve your vision and restore your eyes to a healthier state. Age-related macular degeneration, or AMD, which causes the loss of central vision, affects 15 million Americans. It is the number one cause of blindness among people over 55. Luckily, when caught early, macular degeneration can be stemmed before it robs you of your sight. At our St. Louis, Missouri Eye Centers, we offer some excellent nutritional supplements such as EyePromise™ Restore, that can help maintain the health of your eyes. EyePromise™ Restore is recommended for many patients who have age-related macular degeneration (AMD) or who may be at risk for the condition. It contains a patented level of zeaxanthin, plus lutein—the carotenoids (red and yellow pigments) that make up the pigment in the macula. They are powerful antioxidants that can help lower a person’s risk of AMD. While lutein is readily available in a healthy diet, research shows that even healthy, balanced diets don’t contain enough zeaxanthin to protect against AMD. Lutein’s benefits are known, but recent studies indicate that zeaxanthin may be even more important. To get enough zeaxanthin in your diet would require the equivalent of 20 ears of corn per day to be consumed. 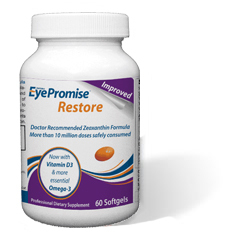 It’s much easier to get what you need in one or two EyePromise™ Restore softgels per day. Other beneficial ingredients found in EyePromise™ Restore are vitamins C & E, zinc, alpha lipic acid as well as omega-3 fatty acids, essential nutrients that are seriously lacking in our diet. How does zeaxanthin protect the eyes? Zeaxanthin works by protecting your macula from high-energy blue-wave light waves that damage the eye, as well as free radicals. Free radicals are harmful molecules implicated in cellular destruction (aging). They are created as natural byproducts of metabolism, as well as a result of ultraviolet and blue light entering the eye. Their creation can be accelerated by chronic fatigue, smoking, and a compromised immune system. As an antioxidant, zeaxanthin is able to neutralize or destroy these free radicals, protecting your eyes from damage from these highly reactive chemicals. Studies have shown that the areas of the macula with the greatest concentration of zeaxanthin are the last to degenerate, and that age-related loss of this nutrient is a factor in both "wet" and "dry" macular degeneration. EyePromise™ Restore combines 20mg of zeaxanthin with other nutritional supplements that help maintain the health of your eyes. If you are interested in EyePromise™ Restore, contact the practice of Dr. Sean Mulqueeny today. Cataracts and dry eyes are common eye problems. In St. Louis, Missouri, Mulqueeny Eye Centers offer comprehensive eye care to treat eye conditions like these, as well as state-of-the-art retinal exams and nutritional supplements to help prevent and fight macular degeneration.